Draft: 2007, Baltimore Orioles, 1st rd. Attended Stratford High School in Goose Creek, SC before attending Georgia Tech in Atlanta, GA...Became the third player in Georgia Tech history to earn first-team All-America honors twice, joining Jason Varitek and Nomar Garciaparra...Named first-team All-America by Baseball America and Rivals.com and first-team All-Atlantic Coast Conference in 2007, first-team All-America by Baseball America and second-team All-ACC in 2006, and ACC Rookie of the Year, Freshman All-America and first-team All-ACC in 2005...Was one of three finalists for the 2007 Johnny Bench Award as the top collegiate catcher and was a semi-finalist for the USA Baseball Golden Spikes Award as the nation's top college player...Served as the Yellow Jackets primary closer for his first two seasons and was one of two closers his junior season...Originally selected by the Baltimore Orioles in the first round (5th overall) in the June, First-Year Player Draft...Resides in Atlanta, Georgia with his wife, Maria, and sons, Maverick, Micah and Murphy. Missed a total of 57 games on the 10-day injured list twice during the season for a left oblique strain (4/2-11, 8 games) and a left hamstring strain (5/11-7/9, 49 games)...Threw out 29.3% (12 CS/41 SB ATT) of attempted base stealers. Ranked 10th among National League catchers with 12 runners caught stealing...Recorded his 500th career RBI vs. CIN (8/3)...Homered in consecutive games twice (4/14-15 & 9/22-24)... Ranked T-3rd among National League catchers with 23 RBI post All-Star Break and 5th in home runs with five. In his first season in Washington, Wieters helped guide a pitching staff that ranked third in the National League in ERA (3.88) and strikeouts (1,457)... Washington's staff was also the first in 21 years with three starting pitchers to rank in the top five in ERA in the National League, according to the Elias Sports Bureau ...He opened the season strong at the plate, hitting .301 (22-for- 73) with five doubles, four homers, 12 RBI, 11 walks and 10 runs scored in 21 April games...Ranked among NL catchers in hits (7th, 95), RBI (8th, 52), and doubles (9th, 20)...Was the ninth of 10 Nationals players to hit 10+ homers in 2017...Clubbed three home runs in 78 at-bats as a righty and seven home runs in 344 at-bats as a lefty...Was the 25th player to play for both Baltimore and Washington...Hit over .300 with runners in scoring position for the majority of the season...From Opening Day through Aug. 15, hit .302 (26-for-86) with three doubles, three homers, 38 RBI with runners in scoring position...Recorded his eighth career multi-HR game on April 30 vs. NYM... Clubbed his third career grand slam on Aug. 6 at CHI (Edwards). Earned his fourth All-Star nod in his first full season since 2013...Hit .243 with 17 doubles, one triple, 17 home runs, 66 RBI, 32 walks and 48 runs scored in 124 games...Posted his seventh career multi-homer game on Oct. 2 at NYY...Registered a career-high tying five RBI for the fifth time on Sept. 10 at DET...Logged a career-high five hits on Aug. 14 at SFG…Became the first Baltimore catcher with five hits since Bob Melvin on June 15, 1991 at TOR...Was one of four catchers with a five-hit game in 2016, joining Salvador Perez (5/23), Carlos Perez (7/2), and Yasmani Grandal (7/8)...Hit his second career Eutaw Street home run in the fourth inning on June 25 vs. TBR...Finished tied for third on the team with 10 game-winning RBI...Hit his 100th career home run as a catcher on June 6 vs. KC…Ranked second (112) on the Orioles all-time list for home runs as a catcher behind only Chris Hoiles (142)...Posted a 31.7% caught stealing percentage, his best mark since 2013 and outpaced his career-average of 30.4%. Voted to his 1st AL All-Star starting spot (3rd All-Star team) despite not playing after May 10...Placed on DL, May 11, with a right elbow strain...Had "Tommy John" surgery on June 17 and was transferred to the 60-day DL on August 13...Was batting .308/.339/.500 through 26 games before his injury (10 multi-hit games)...Had a season-opening eight game hit streak, March 31-April 9 (.367/.394/.600)...Batted .325/.367/.482 in 90 plate appearances vs. RHP...Hit 3rd career walk-off HR, May 1 vs. PIT (G2 of DH), a 10th inning blast to give the O's a 6-5 win...Was his 6th career walk-off hit. Led AL catchers in G (140), AB (496), HR (21) and RBI (76), was 2nd in R (58) and H (121), and 3rd in 2B (29) and SLG (.429)... Set career-highs in G (148) and 2B (29) and defensive career-highs in games caught (140), innings caught (1201.0) and total chances (1021)... Caught 22 of 66 attempted base stealers (33.3%)…33.3% caught stealing rate and 22 CS were 2nd in the AL... Is the only catcher in baseball with 50 or more extra-base hits in each of the last three seasons, 2011-2013... Made 4th straight Opening Day start, April 2 @TB, reaching base safely four times... Hit 10th inning walk-off Grand Slam (2nd career GS), April 18 vs. TB (Gomes)... Had season-long seven-game hit streak (including 5G multi-hit game streak), July 14-25 (.448; 13-29, 2BB, 2-2B, 2HR, 6R, 4RBI)... Snapped career-worst 0-for-25, August 3 vs. SEA... Had game-ending CS of K. Johnson, August 21 vs. TB... Became the 1st player in club history with three consecutive seasons of 20+ HR as a catcher, September 6 vs. CWS... Hit walk-off 2RBI single in the 10th inning, September 7 vs. CWS... Batted .282/.326/.546 in 178 plate appearances vs. LHP... Was a Gold Glove finalist (award won by Perez, KC). Made first All-Star team, going 0-for-1 in the game ... Won his first career Rawlings Gold Glove Award with a .995 fielding percentage which tied for the AL lead among catchers ... Became the first Orioles catcher to win a Gold Glove ... Set career-highs in G (139), AB (500), R (72), 2B (28), HR (22), RBI (68), BB (48) and SLG (.450) ... Hit 20 home runs as a catcher, the 6th such season in O's history (Hoiles - 29 in '93, 25 in '96 and 20 in '92; Hernandez - 23in '06 and Johnson - 21 in '00) ... Led AL catchers (min. 90G) with a caught stealing rate of 37.0% ... Led AL catchers in runs (68), was second in hits (126), 2B (27) and home runs (20), third in RBI (66) and OPS (.774) andfourth in walks (47) ... Was second among AL catchers in innings (1150; Avila - 1157) and games (132; Avila - 133)Charged with only one passed ball this season...Every other AL catcher with 90 games or more had at least four passed balls ... Improved his AB/HR ratio from 34.5 in the first half of the season to 16.0 in the second half, hitting 14 of his 22 home runs afterthe break ... Had career-high 10 game hit streak, May 8-21, (.400; 18-for-45) ... Set career-high with 3 runs, April 19 vs. MIN ... Matched season-high with four RBI, April 29 @CWS ... Batted .324/.390/.649 in 11 game stretch, April 17-29 ... Hit game winning RBI single in the 13th inning, May 10 vs. SEA ... Threw out two attempted base stealers, including one to end the game, May 22 vs. WAS ... Had six three hit games; May 15 and 18, June 11, July 5 and August 8 and 20 ... Hit game-tying two run home run, June 14 @TOR ... Drew career-high three walks, July 7 @BOS ... Made first ML start at firstbase, August 21 @LAA ... Reached base safely a career-high five times (2B & 4BB), August 23 @MIN ... Batted .302/.381/.570 in 24 August games ... Homered in three straight vs. TB, September 12-14 ... Batted .277 (71-256) with an .844 OPS in 72 home games and .246/.710 in 67 road games ... Hit .259/.336/.504 after the All-Star break ... Batted .321/.407/.519 in 123PA with RISP, the 13th best RISP avg. in the AL this season ... Hit .435/.552/1.043 in 29PA in seven games vs. MIN. Named Baseball America's Player of the Year and Named to the Bank of America First Team All-Star Team...Recipient of the Brooks Robinson Award...Began the year with Class-A Frederick and hit .345 (79-229) with eight doubles, 15 home runs, 48 runs & 40 RBI in 69 games...Went 2-for-3 with a walk, 2 home runs, 3 runs scored and 3 RBI in his first professional game, April 4 vs. Lynchburg...Had a 2-home run game twice more for the Keys (May 9 @ Lynchburg and May 18 vs. Lynchburg)...Collected 4 hits and 4 runs scored for the Keys on June 6 @Winston-Salem...Transferred to Bowie on June 27, where he hit .365 (76-208) with 14 doubles, two triples, 12 home runs, 41 runs & 51 RBI in 61 games...Went 3-for-3 with a walk, 2 runs scored, 2 home runs and a career-high 6 RBI on August 8 vs. New Britain...Named the Organizational Player of the Month with Frederick in April, hitting .338 (24-71), with four 2B, five HR, 15 runs & 15 RBI...Named the Topps Player of the Month with Frederick in May, batting .337 (32-95) with two 2B, seven HR, 21 runs & 18 RBI...Named the Carolina League Player of the Week, May 5-11...Named the Organizational Player of the Month for August with Bowie, hitting .364 (36-99) with five 2B, 3B, six HR, 21 runs & 23 RBI...Had a season-high 17-game hit streak, July 1-18. Signed his first professional contract on August 23 and reported to Short-A Aberdeen...Worked out over the final week of season but was not activated...Made his pro debut with the Honolulu Sharks in the Hawaiian Winter League, where he batted .283 (30-106) with 9 doubles, a triple, homer and 17 RBI in 31 games...Hit safely in 22 games and reached base by hit or walk in 27 of 31 games, including 21 of his first 22 contests...Went 4-for-5 with 2 doubles, a homer and 3 RBI on October 26 vs. North Shore...Named the Orioles #1 prospect by Baseball America after the season. Hit safely in 54 of 68 games and batted .355 with 15 HR and 71 RBI...Named MVP of the NCAA Atlanta Regional after reaching base safely in 14 of 15 plate appearances, going 8-for-9 with 6 RBI, 6 runs, 6 walks and 3 HR...Hit .560 (14-25) with 5 HR, 10 RBI, 12 runs, 9 walks, and one HBP in 7 NCAA Tournament games....As a pitcher, went 1-3 with 7 saves and a 3.41 ERA. Hit .366 with 10 home runs and posted a .470 on base percentage...Had 68 RBI, a Georgia Tech record for freshmen... Earned ACC and National Player of the Week honors after going 12-for-14 with a grand slam and 8 RBI in Tech's sweep at Duke, 3/4-3/6...Earned his second ACC Player of the Week award on 3/28...Went 3-3 with 6 saves and a 2.85 ERA in 26 pitching appearances. March 22, 2019 St. Louis Cardinals selected the contract of C Matt Wieters from Memphis Redbirds. February 27, 2019 St. Louis Cardinals signed free agent C Matt Wieters to a minor league contract and invited him to spring training. 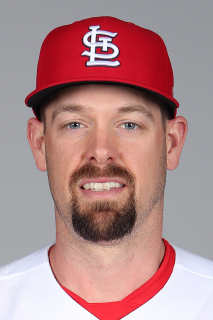 February 27, 2019 C Matt Wieters assigned to Memphis Redbirds. October 29, 2018 C Matt Wieters elected free agency. July 9, 2018 Washington Nationals activated C Matt Wieters from the 10-day disabled list. July 7, 2018 Washington Nationals sent C Matt Wieters on a rehab assignment to Harrisburg Senators. May 11, 2018 Washington Nationals placed C Matt Wieters on the 10-day disabled list. Left hamstring strain. April 11, 2018 Washington Nationals activated C Matt Wieters from the 10-day disabled list. April 10, 2018 Washington Nationals sent C Matt Wieters on a rehab assignment to Potomac Nationals. April 2, 2018 Washington Nationals placed C Matt Wieters on the 10-day disabled list. Mild left oblique strain. February 24, 2017 Washington Nationals signed free agent C Matt Wieters. November 3, 2016 C Matt Wieters elected free agency. August 22, 2016 Baltimore Orioles activated C Matt Wieters from the paternity list. August 20, 2016 Baltimore Orioles placed C Matt Wieters on the paternity list. November 13, 2015 Baltimore Orioles activated C Matt Wieters. November 2, 2015 C Matt Wieters elected free agency. June 5, 2015 Baltimore Orioles activated C Matt Wieters from the 60-day disabled list. June 2, 2015 Baltimore Orioles sent C Matt Wieters on a rehab assignment to Norfolk Tides. May 26, 2015 Baltimore Orioles sent C Matt Wieters on a rehab assignment to Bowie Baysox. November 3, 2014 Baltimore Orioles activated C Matt Wieters from the 60-day disabled list. August 13, 2014 Baltimore Orioles transferred C Matt Wieters from the 15-day disabled list to the 60-day disabled list. May 11, 2014 Baltimore Orioles placed C Matt Wieters on the 15-day disabled list. Strained right elbow. July 25, 2010 Baltimore Orioles activated C Matt Wieters from the 15-day disabled list. May 29, 2009 Baltimore Orioles selected the contract of C Matt Wieters from Norfolk Tides.